Interessante Darstellung des Königreiches Brasilien in geographischer, statistischer, naturhistorischer, politischer und mercantilischer Hinsicht. Nebst Nachrichten uber Chile und die Halbinsel Patagonien. MÜNCHEN. "Isar Thor Von München, erbaut um das Jahr 1310." Blick von Südosten auf die Stadtaußenseite, links der bewachsene Stadtgraben, vorne reizende Staffage. - Kol. Lithographie von Math. Heim, dat. 1817, 27 x 32,5 cm. Winkler 313, 5, I; Maillinger I, 1783; Slg. Proebst 589; nicht bei Lentner. - Geglättete Längsfalten, nur ganz schwach fleckig. Seltene, fein kolorierte Ansicht, "gemahlt und gezeichnet" von einem Schüler Quaglios und Wagenbauers. CHARTE VON DEN VEREINIGTEN STAATEN VON NORD - AMERICA .&#146;. The 23United States east of the Mississippi; the area west is generally called Louisiana. Franz Ludwig Güssefeld for Verlag des Geograph. Instituts Weimar 1817 - 47x68cm. Original outline colour. Excellent condition. [A Catalogue Of The Library Of An Eminent Bibliographer.
] 8vo. London: Printed by W. Bulmer and Co. Cleveland-Row St. Jamesâ€™s, 1817.] 8vo, 18 leaves, (-2)  2-35 (1) (=36 of 38p, lacking the title.). Stitched as issued, in a morocco pull-off box lettered in gilt. A bit worn around the edges, untrimmed. Sole edition. This is the Pirie copy of the â€˜bâ€™ issue, partially priced. The â€˜aâ€™ issue, of which only 24 were printed has the heading Bibliotheca Rosicrusiana. The heading refers to one of the pseudonyms used by Dibdin in his Bibliomania. and has no occult significance. Both the Harvard University (Dawson Turner) copy and the Grolier Club copy are inscribed â€˜Only 24 copies with this head-title. T.F.D.â€™ The former lacks the slip with lot 770. The number of â€˜bâ€™ issue copies, without the heading but otherwise identical, is not known. 770 lots are described; the final lot was printed on a paper slip and pasted into some copies but not this one (the Barlow copy has several additional lots written in, including two at the end.) The Grolier Club â€˜aâ€™ issue copy was sent by Dibdin to Thomas Sharpe Esq. of Coventry; no prices are recorded but Sharpe did mark lot 739, the Caxton. The Grolier Club â€˜bâ€™ issue copy is priced. Jackson (p. 34) writes: â€˜The Harvard (Hunnewell) copy â€¦ is interleaved with prices and buyersâ€™ names and notes of a score or more books sold but not included in the printed catalogue.â€™ The Harvard, Rylands, Corser (at Cambridge University), and Barlow copies (all with manuscript addenda) suggest that the auction house added lots up to the last minute and wrote these into catalogues as possible. (A second copy at the Rylands, purchased from Sotheran at the beginning of the century was unavailable for examination.) For a reproduction of the Bodleian copy together with the auctioneerâ€™s notes from the one in the British Library, see A.N.L. Munby, â€œDibdinâ€™s Reference Library: the sale of 26-28 June 1817,â€ Studies in the Book Trade in Honour of Graham Pollard (Oxford Bibliographical Society, 1975), pp.279-314. Recorded copie are: â€˜aâ€™ issue: Grolier Club, Arthur Freeman, Houghton Library (Dawson Turner-Jackson). â€˜bâ€™ issue: Wm. P. Barlow Jr (Lefferts; p & n), Boston Public Library, Bernard Breslauer (Abbey sale IV, 2269), Cambridge University Library (Corser), Roland Folter, Grolier Club, Houghton Library (Hunnewell), H.P. Kraus, Pierpont Morgan Library (lacking title-page), John Priddy (p & n), John Rylands University Library (p & n). PICTURESQUE RIDES AND WALKS, WITH EXCURSIONS BY WATER, THIRTY MILES ROUND THE BRITISH METROPOLIS; Illustrated in a Series of Engravings, Coloured after Nature: with an Historical and Topographical Description of the Country within the Compass of that Circle. 1817 1817 - Federlithographie mit hell-oliver Tonplatte und sparsamen Lichtern, 1817, nach Johann Jakob Dorner d.J. (1775-1852), auf cremefarbenem Velin. Darstellungsgröße 26,8:25 cm, Blattgröße 38:29,9 cm. Literatur: Maillinger I, 2396; Aufseesser 215; Dussler 1; Winkler 525.3. &#150; Inkunabel der Lithographie! Melchior war bis 1818 in Nymphenburg tätig und ging dann auf Wanderschaft. Er schuf 40 Lithographien für das Werk &#132;Anfangsgründe zur Landschaftszeichnung", das 1817 erschien. Das oben beschriebene Blatt stammt aus dieser Folge. [Letter acknowledging payment from the Paris bookseller Debure for Les Roses , part 30]. Paris, 18 February 1824. 4to (24.5 x 18.5 cm). Autograph letter, signed, written in brown ink on paper, with a note in a different hand recording a related payment. A signed autograph letter by Pierre-Joseph Redouté, acknowledging his reciept of 30 francs from "Monsieur Debure libraire" for the 30th and final part of Les Roses, Redouté's most famous work, which was published in installments between 1817 and 1824. This must be the Paris bookseller Jean-Jacques Debure (1765-1853) or his younger brother Marie-Jacques Debure (1767-1847), who were "libraires du Roi et de la Bibliotheque du Roi" from 1821 to 1830. The book was printed and published by Firmin Didot. Oddly, an addition by a different hand below left notes "payé le 26 fevrier" (paid 26 February). Perhaps Redouté is writing to Firmin Didot and he was to reimburse Debure for this expense. It in any case suggests that Debure is not merely buying copies of the book to sell but was involved in the publication of Redouté's Les Roses in some manner. In fine condition, with only a small piece of paper stuck to the top right corner, not approaching the text. Altteutsche Volks- und Meisterlieder aus den Handschriften der Heidelberger Bibliothek. Herausgegeben von (.). Mit einem Kupfer (N.MÜLLER del. ; F.GEISSLER sc.). 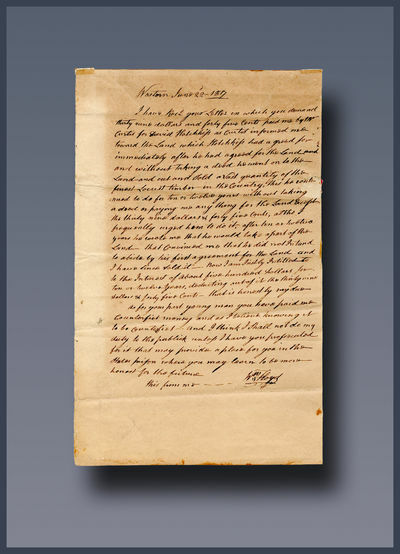 Signer of the Declaration of Independence, William Floyd, accuses a young man of sending him " Counterfeit money...and I think I shall not do my duty to the public unless I have you prosecuted for it that may provide a place for you in the States prison where you may learn to be more honest for the future "
Vereinigte Staaten in Nord America nach den besten Hülfsmittel verfast, Wien bey T. Mollo. Mollo 1817-20, Vienna - Copper engraving, hand colored in outline when published. In excellent condition. Berlin. -. Faint toning, folded for mailing, slight roughness to upper edge.. Two pages, on recto and verso of a single bifolium, approx. 5-1/2 X 4-1/4 in. 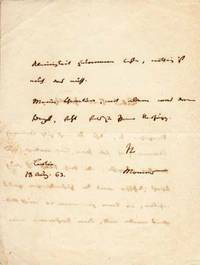 Theodor Mommsen (1817-1903) was a lawyer, historian, scholar, and political figure. He received the Nobel Prize for Literature in 1902. United States of America [with] The Course of the River St. Lawrence from Lake Ontario, to Manicouagan Point. Edinburgh: John Thomson 1817 - Two maps engraved by J. & G. Menzies, on one double page sheet (sheet 55 x 70 cm.) US map 41 x 37 cm River 41 x 23 cm, original hand-colour. Small pinprick holes to centrefold. Issued in the 1817 edition of Thomson's 'New General Atlas'. Gesamtans., "Vue de Coblence et de la Fortresse Ehrenbreitstein avant sa démolition" . - altkol. Umrißkupferstich n. Schütz b. Mechele, dat. 1817, 40,7 x 57 Malerische Ansicht, im Vgr. figürliche Staffage. Ansicht von Koblenz und Ehrenbreitstein. Moeurs et costumes des Russes, représentés en 50 planches coloriées, exécutées en lithographie. London, 1817. Original printed wrappers. Minor soiling, small repairs on spine, ink signature on front cover. Contemporary ownership signature on titlepage. Very good. Untrimmed. In a red cloth clamshell box, spine gilt. The Harmsworth-Streeter copy of this rare and important work of Canadiana. This pamphlet presents a brief outline of the establishment and growth of the Selkirk Colony from 1812, and attempts to defend and justify the North West Company's actions as the natural consequence of the encroachments, hostilities, and provocations of Lord Selkirk and the Hudson's Bay Company. Although sometimes attributed to Simon McGillivary and Edward Ellice the elder, the work was probably prepared by Samuel Hull Wilcocke, "a hack-writer in the employ of the North-West Company" (TPL). The pamphlet was issued under the direction of the London representatives of the North West Company to counter charges of unwarranted aggression and destruction of the Selkirk settlement on the Red River, leveled against them by John Halkett in his STATEMENT RESPECTING THE EARL OF SELKIRK'S SETTLEMENT (1817). "This narrative is the second of that long catalogue of statements, histories, and narratives to which the murder of Governor Semple by the half-breed Indians, in the service of the Northwest Fur Company, gave existence. The first publication was the 'Sketch of the Fur Trade in North America,' by the benevolent and enterprising Lord Selkirk. This narrative is the rejoinder of the Northwest Fur Company, covering pp. 1 to 152. The Appendix which follows, paged separately 1 to 87, is composed of affidavits of the traders, of Indian speeches, etc" - Field. "An important work relating to the foundation of Winnipeg" - Harmsworth. HARMSWORTH 6362 (this copy). STREETER SALE 3675 (this copy). LANDE 1313. TPL 1108. PEEL 50. VLACH 761. GAGNON II:1948. SABIN 20699. FIELD 1117. London, 1817. 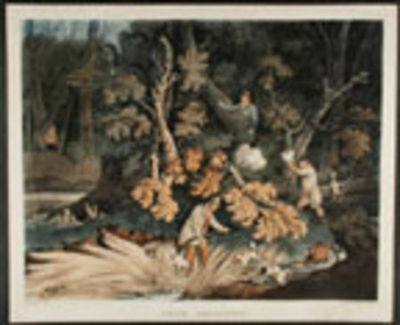 Aquatints, coloured by hand, by T. Sutherland. (First print with skillfully repaired tear). Sheet sizes: 14 7/8 x 18 1/8 inches and 15 x 18 1/4 inches. A lovely pair of sporting prints Henry Thomas Alken was born into what became an artistic dynasty. He studied under the miniature painter J.T. Barber and exhibited his first picture (a miniature portrait) at the Royal Academy when he was sixteen. From about 1816 onwards he "produced an unending stream of paintings, drawings and engravings of every type of field and other sporting activity. He is best remembered for his hunting prints, many of which he engraved himself until the late 1830s ... To many, sporting art is 'Alken', and to describe his work or ability is quite unnecessary" (Charles Lane British Racing Prints pp.75-76). Siltzer, p. 57; Snelgrove Alken 46. Der deutsche Handelskanal oder die schiffbare Verbindung der deutschen Meere, Flüsse und Handels-Staaten, nach älteren und neueren Vorschlägen, das nützlichste und würdigste Denkmal für Deutschlands wiedererrungene Freiheit. Kst.- Karte, bestehend aus 2 zusammensetzbaren Blättern n. I.C.M Reinicke, "Charte von Ostindien dieseits und jenseits des Ganges .". - mit altem Grenzkolorit, dat. 1817, zusammensetzbar auf die Grösse 49 x 87 Mittig, am linken Rand, die Titelkartusche. Kartenmittelpunkt ist Indochina. Im Westen Indien, im Nordosten Indochina, im Osten die Philippinen, im Südosten Indonesien. dessine sur le Dôme par Henry Keller de Zurich, gravé par F. Schmid. Kupferstich-Panorama (Blattgr. ca. 19,8 : 193 cm; Bildgröße ca. 15,5 : 187 cm) in Leporellofaltung; von vier Platten gedruckt. Zürich, Keller & Füssli, 1817 (in der Platte 1816 datiert). Marmorierter Pappband mit gest. Deckelschild; hinterer Innendeckel mit montierter Aquatintaansicht: L'aiguille du Dôme de Milan / La Cupola del Duomo di Milano. London, printed by and for William Darton, Jun. 58 Holborn Hill, 1817 and 1816.. 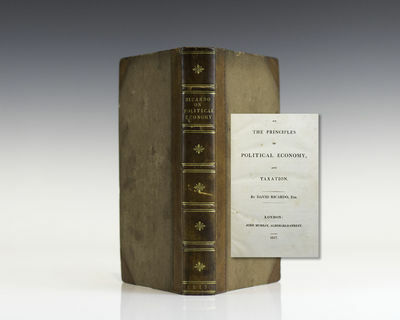 In 2 volumes, complete set, Part I is an early reprint 1817, Part II is a first edition 1816 (Part I first published in 1815). 12mo, 155 x 100 mm, 6 1/8 x 3 7/8 inches, original publisher's printed yellow stiff paper wraps, lower covers with publisher's adverts, pages: viii, 9-60 + (4) - adverts; (2), 3-63, + (1) -adverts. Each volume has a folding copper engraved plate as frontispiece plus 2 copper plates. Covers slightly dusty, a few minor marks, small brown stain on lower cover of Part II, slight wear to spines, the same neat old name in margin of title pages, name scraped off front pastedown of Part II, one or two small pale marks to contents. A very good plus set of a rare early children's item, uncommon to find both volumes together and in such nice condition. In her preface dated from Ipswich, Jan. 1815, the author says that she was inspired by Miss Edgeworth's 'Early Lessons' to write this story for the instruction and amusement of a dear nephew. The Dartons, page 541, No. H1079 and H 1080; Osborne I page 315 (1825, first part only) and II page 913 (2 Parts, first editions); Oppenheimer Catalogue 2601, 1825 defective. MORE IMAGES ATTACHED TO THIS LISTING, ALL ZOOMABLE, FURTHER IMAGES ON REQUEST. POSTAGE AT COST. Eassai sur la Torsion des Pieds (Pied Bots), et sur le meilleur moyen de les guérir. Firmin Didot 1817-24, Paris - Stipple engraving, printed in colors and finished by hand, engraved by Bessin. Published 1817-24 in the famous large series by Pierre Joseph Redouté 'Les Roses'. Overall very clean, some minor surface soiling on paper. With small margin around the visible plate mark. Image size: 13 3/4 x 10 1/8 x Sheet size: ca. 14 1/4 x 10 7/8 inches. In very good condition. La Divina commedia di Dante Alighieri con tavole in rame. Nella Tipografia all&#146;Insegna dell&#146;Ancora, Firenze 1817 - Tav. calcogr. disegnate da Luigi Adamolli e incise dallo stesso e da Giovanni Paolo Lasinio. Splendido esempio di illustrazione libraria della Divina Commedia dedicata dagli editori allo scultore Antonio Canova. Completa di tutte le 125 tavole. Formato: 3 v. (, 208 p., XLIV c. di tav. ; , 210,  p., XL c. di tav. ; , 206,  p., XLI c. di tav. ), 47 cm, mezza pelle con punte con dorso a cinque nervi, fregi e titoli oro dei primi del Novecento. Buono, ordinari segni d&apos;uso e del tempo, fioriture anche estese più evidenti ad alcune pagine. Skizzenheft mit 20 Genreszenen aus dem Leben der Bauern und Hirten in der italienischen Campagna, Tivoli (2 Bll.) und Napoli (2 Bll.). Bleistift und Aquarell. Sole printing of the committee report that led to the adoption of the composition of the U.S. flag as 13 stripes to represent the original colonies and one white star on the blue field for each state fully admitted to the union.=> A landmark piece of Americana. NEW ZEALAND Narrative of the Briton's Voyage to Pitcairn's SHILLIBEER 1817A Narrative of the Briton's Voyage, to Pitcairn's Island; Including an Interesting Sketch of the Present State of the Brazils and of Spanish South America; J. Shillibeer; London; Second Edition; Law and Whittaker; 1817; 8vo; 180 pp. ; 12 plate, two enfolded. Recently re-backed into tree calf boards with full gilt spine to period. Interior text has light scattered foxing throughout. Some areas with underlining and marginalia. Enfolded plates Have been repaired and refolded neatly back into the book. Frontice and title page have been gently washed along with the final 2 pages. London: Rest Fenner,, 1817. or Biographical Sketches of My Literary Life and Opinions. 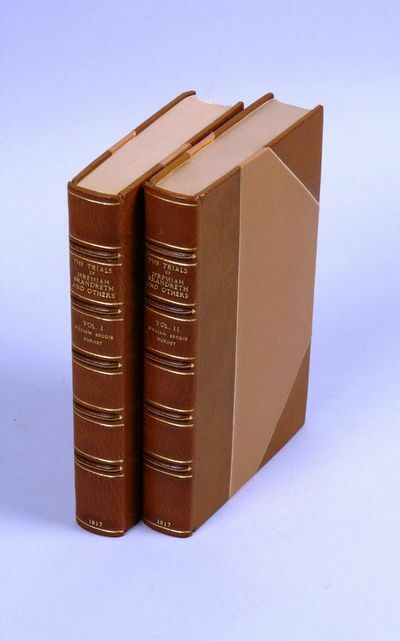 2 volumes, octavo (210 Ã— 128 mm). Later 19th-century ochre half morocco by J. 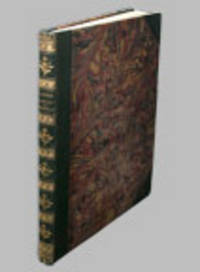 B. Hawes of Cambridge, spines in compartments with raised bands and gilt titles and fleurons, marbled sides, marbled endpapers, top edges gilt, others untrimmed. Half titles in both volumes and 3 pages of publisher's advertisements at the rear of volume two. Spines very slightly tanned, tiny nicks to corners, some light spots to the leather of volume one, occasional spotting within, very good condition indeed. 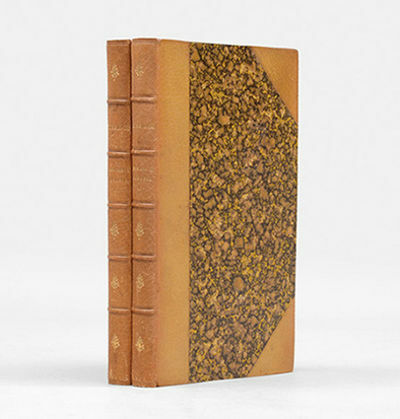 First edition, with the half titles and advertisements, notably untrimmed in a signed later 19th-century binding, of Coleridge's autobiography, a monument to the Romantic movement and Coleridge's role in it, in which literary criticism and philosophy are inextricable from biography. In Biographica Literary, which is utterly characteristic of him in its fragmentary and digressive form, Coleridge recounts his friendship with Southey and Wordsworth, describes the important influences on his personal philosophical development (and, it should be inferred, through him to the the rest of the English Romantic scene) of early German philosophers such as Kant, Fichte and Schelling, while offering searching criticisms of Wordsworth's poems and making his famous distinction between 'fancy' and 'imagination', expressing the difference between a mechanical making and a creative artistic power linked to the divine. The second volume includes a detailed criticism of the social theory of the preface to Lyrical Ballads, to which he himself had contributed. This copy is from the library (though without ownership mark) of Scottish publisher Alexander Macmillan (1818-1896), founder, with his older brother Daniel, of Macmillan & Co - J. B. Hawes were one of the Cambridge binderies used by Macmillan. Sibylline Leaves. A Collection of Poems. Mollo 1817-23, Wien - Copper engraving, hand colored in outline when published. In excellent condition. 1817 - Signiert, datiert und bezeichnet "Pinelli 1817 Roma" bzw. "Pinelli f. 1817 Roma" (Bl. 4), Bl. 16 ohne Signatur. Alle mittig, unterhalb der Einfassungslinie bezeichnet. Auf feinem Bütten mit WZ. Sehr farbfrische, großformatige Aquarelle des italienischen Zeichners und Graphikers B. Pinelli. Im Zentrum eines jeden Blattes stehen voll ausgeführte und mit Tusche und Aquarell modellierend durchgearbeitete Genrefiguren, sie werden in ihre Umgebung eingebunden, diese bleibt jedoch stets auf wenige Umrisse reduziert. Das Skizzenheft ist wohl ist als Radiervorbereitung angelegt, die durchgehende Verwendung einer Einfassungslinie und die einheitliche Form und Gestaltung deuten darauf hin. 1819 und 1823 erscheinen Trachtenwerke Pinellis, in denen einzelne Figuren oder ganze Figurengruppen des Skizzenheftes, wenn auch in veränderter Haltung, wiederzufinden sind. - Pinelli studiert an den Akademien in Rom und Bologna, um 1800 beginnt er seine Arbeit bei dem Vedutenmaler Fr. Kaisermann, dessen Landschaften er mit Staffagefiguren belebt. In der Folge gewinnen Pinellis Schilderungen des bäuerlichen Volkslebens eigenständige Bedeutung. - In den unteren Ecken der Einfassung mit winzigen Nadeleinstichen. - Zeichnungen im Außenrand teils minimal stockfleckig, wenige Bll. mit leichten Knickspuren im Rand. Deckblatt und die Schmutzblätter braunfleckig und mit leichten Gebrauchsspuren. - Margenbesteuerung. Sprache: Deutsch Gewicht in Gramm: 2100 18,2 x 22,6 cm. Papier: 22 x 33 cm. On The Principles of Political Economy and Taxation. The Trials of Jeremiah Brandreth, William Turner, Isaac Ludlam, George Weightman, and Others for High Treason..
London: Butterworth and Sons, 1817. Two volumes, octavo, an excellent set in deep brown crushed morocco by Sangorski, spine with raised bands and gilt lettering, top edges gilt. Rare original record of the High Treason trials that resulted from the last of the English peasant revolts, the so-called "Brandreth Riots" or "Pentrich Revolution", an armed insurrection of workers protesting against pay and conditions in the Nottingham area.Fourteen of the "conspirators" were transported to Australia (the three ringleaders, sometimes called "The Pentrich Martyrs" - Jeremiah Brandreth, William Turner and Isaac Ludlam - were hanged and beheaded). Shelley famously lamented the judgement in An Address to the People on The Death of the Princess Charlotte: 'a calamity such as the English nation ought to mourn with an unassuageable griefâ€¦'.Only the Mitchell and National Library copies of the book are recorded by Ferguson. STRAPAROLA [da Caravaggio, Giovan Francesco]. Die Märchen des Straparola. Aus dem Italiänischen mit Anmerkungen von Dr. Friedr. Wilh. Val. Schmidt. London: printed for Longman, Hurst, Rees, Orme, & Brown [and others], 1817. 1 uncoloured engraved plates of practice strokes, 12 hand-coloured stipple engraved plates after Brookshaw, the first 11 of these hand-coloured plates also present in a second uncoloured state, the final hand-coloured plate faced by an uncoloured pencilled version of the final plate on early Whatman paper (25 plates in total), 8 text pages with integral hand-coloured examples of tints. (Title with old crease). [Bound with:] Supplement to the Treatise on Flower Painting, consisting of eight plates of flowers, accurately drawn and coloured from nature. London: printed for Longman, Hurst, Rees, Orme, & Brown and John Lepard, 1817 [plates watermarked 1817]. 8 hand-coloured stipple-engraved plates after Brookshaw, plus each plate present in a second uncoloured state (16 plates in total). 2 works in one volume, royal quarto (11 1/8 x 9 inches). Expertly bound to style in half green straight-grained morocco over contemporary marbled paper-covered boards, flat spine in six compartments divided by roll tools and fillets, lettered in the second compartment, the others with a repeat floral decoration in gilt. Very rare: no examples of this combination are listed as having sold at auction in the last thirty-five years. The publishing history of the New Treatise is complicated: Brookshaw appears to have published up to three editions in parts, anonymously or using the pseudonym G. Brown, between 1797 and 1803. 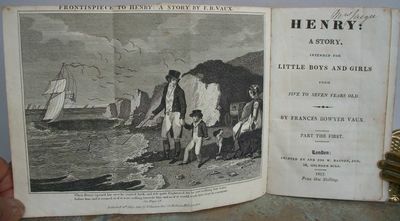 In 1816, the first edition to be published under Brookshaw's own name appeared, and in 1818 an expanded edition appeared. The Supplement is particularly rare: only one edition is known and only the Plesch copy is recorded as having sold at auction. 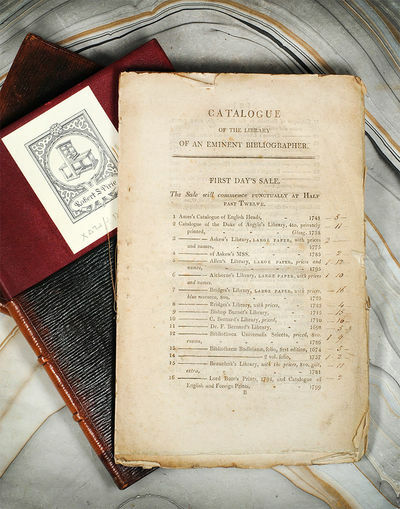 The present volume includes a hitherto unrecorded variant of the first work, dated 1816 but issued in 1817, probably to accompany the brand new Supplement (as here). Brookshaw paired the coloured and uncoloured plates intending that the coloured plates should be used as models by the aspiring artist to colour the facing page. The present examples avoided that fate, although, intriguingly, one of the uncoloured plates is executed in pencil rather than being printed. cf. 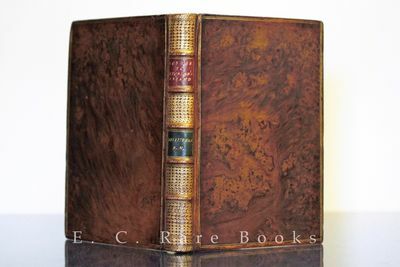 Dunthorne 52 (1818 edition of the first work); Henrey III, cf.518 (1816 edition) & 520; cf. Lowndes I, p.284 (mentions the Treatise with a Supplement); cf. Nissen BBI 246 (1818 edition of the first work). \"Ansicht des von Ertl`schen Schlosses in München über den Teich\" und \"Ansicht des von Ertl`schen Schlosses in München mit der Mühle\".